A simple business strategy landed CB’s Nuts in the pages of The Wall Street Journal. 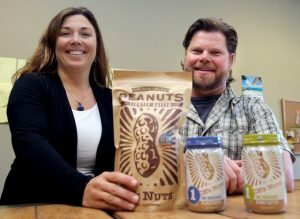 The Kingston-based company’s peanut butter was featured in art accompanying a story about food makers marketing products that incorporate a small number of ingredients. Much, much larger corporations are adopting a similar philosophy, according to the WSJ’s Anne Marie Chaker. Industry juggernauts Hershey Co., ConAgra and General Mills are all pushing products with fewer additives, and using slimmed-down ingredients lists as a marketing tool. “Instead of burying ingredient lists in the fine print on the back of the package, food manufacturers are trumpeting simpler formulas prominently on the label’s front,” Chaker writes. Read the full story here. In other CB’s Nuts news, you may have noticed a Northwest-themed mural painted on a storage container outside the company’s Bond Road headquarters.